...Ebara Pumps & Agriculture Solar Powered Water Pump Power Increases Efficiency, Lowers Costs and Maintenance. We offer tailor-made solutions that work with you to create energy cost savings. EBARA Pumps and Agriculture Solar provides engineered pump, pump products and related services for the water, energy and power industries offering reliable product knowledge, application expertise and responsive support including aftermarket replacement parts services. With horsepower ranges up to 800 HP and capacities to 35,000 GPM, EBARA Pumps and Agriculture Solar meet a wide range of applications. Our service and parts are available through an extensive service network throughout North America to assist customers in replacement of parts or complete pumps, motors, and power supply. Recognizing the continued strain on water infrastructures with increased maintenance, energy and environmental demands and costs, EBARA Pumps and Agriculture Solar strives to deploy the best water pumps, pump products, and technologies to meet these requirements. At Agriculture Solar, Ebara Pumps and Agriculture Energies can be your simple water pump solution. Founded in 1912, EBARA Pumps is recognized as a world leader in the design, development and manufacture of industrial machinery with a predominant focus on the production of pumps and pumping systems for a wide range of applications. Ebara Pumps and Agriculture Solar blends superior engineering expertise with state of the art production techniques to produce pumps and powered systems of unsurpassed quality and long life. Ebara remains the largest single brand pump company in the world and strives to develop high quality, efficient products and key system components for addressing improvements and solutions in the fields of water supply, energy and environmental issues. Agriculture Energies systems have been dedicated to modern agricultural irrigation and successfully active in the top irrigation fields for over 10 years and continues to bring the tried and true principles and advantages of solar hybrid power. Think about it, and then make your move. Let Ebara Pumps and Agriculture Solar water management provide you with decades of reliability and lasting value. 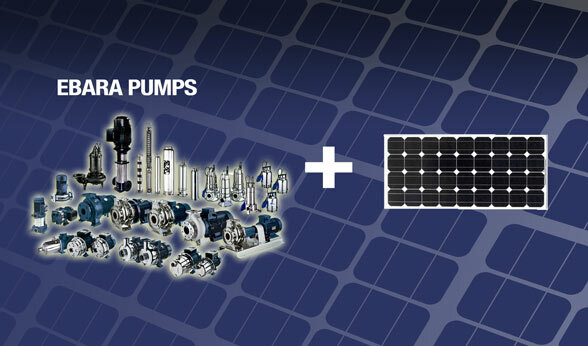 We invite you to explore the possibilities of our reliable hybrid solar powered pump solutions.